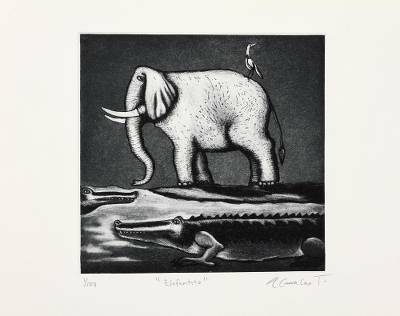 Signed Surrealist Print of an Elephant from Mexico, "Little Elephant"
Mexican artist Alejandro Camacho works in the traditional style of printmaking, diligently etching a surrealist composition in resin to be applied with ink. In black and white, a large elephant and its bird friend explore a surrealist landscape teeming with alligators. Part of a limited edition series, this print arrives on a mat board passe-partout.